Young Thug is without question 2013's undisputed Rookie of the Year. Since dropping his wildly diverse 1017 Thug in January, Thugga has been steamrolling his way through every feature and mixtape verse like a man possessed. Ironically enough, he often literally sounds like a man possessed changing his vocal inflection and cadence at a moments notice simply to suit his whims. Every time he guest stars on a record he completely steals the show — see Gucci Mane's "Chasin' Paper" or Rich Home Quan's "Get TF Out My Face" — and the plethora of bangers he's given DJs and producers in the last few months — notably "Danny Glover," "Stoner," "Some More," and "Can't See 'Em" — have been unfuckwitable, particularly "Danny Glover," which may be in the running for best rap song of the year. The rising trap star continues to build momentum with his latest track "Geek'd Out My Mind," a woozy, trance-inducing ode to indulging in the use of copious amounts of drugs, and he continues his incredible streak of providing flawlessly entertaining music of the highest caliber. 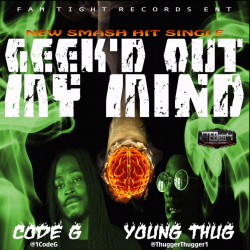 "Geek'd Out My Mind" features a hook and verse from Code G, a relatively unknown Atlanta rapper with an understated delivery in comparison the Thug's animated theatrics, but the two play off each other rather well, each shining in individual moments. However, Young Thug once again plays the role of showstopper with a spellbinding third verse accentuated by amazing ad-libs and featuring quotables like, "Not washing dishes? Get out of the kitchen / and Brrr them birds take a shower / Racks stacked up like midgets / the weed I smoke's sour and louder." If you can't appreciate him as a musician, at the very least you should be able to appreciate him as an entertainer. Stream Young Thug's "Geek'd Out My Mind" below, check out the incredible "Danny Glover" while you're at it, and be on the watch for the ATLien to come out strong in 2014. Really? Rookie of the Year? That Danny Glover track is weak. He sound like a child of the Migos and Danny Brown. In a dedication to SoundCloud, Chance The Rapper & Young Thug present "Big B's"
Shlohmo sets the vibe with his mix, "For Tha Summer (vol. XXVII)"